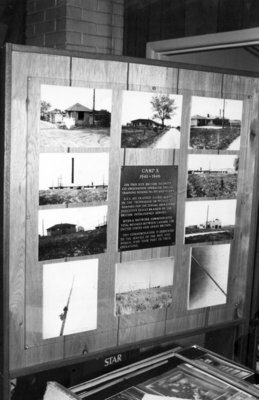 A black and white photograph of a display of photographs of Camp X that were part of the Camp X Museum Collection. Camp X was a spy training camp and communications centre established by British Security Co-ordination on the shore of Lake Ontario on the border between Whitby and East Whitby Townships. The camp operated from 1941 to 1945. It was used as a government communications centre until 1969. The buildings were demolished in 1971-1972. The Camp X Museum was part of the Robert Stuart Aeronautical and Camp-X Collection located at 1000 Stevenson Road North in Oshawa, Ontario. The museum was closed in 2010 and the collection was sold. A small number of artifacts were acquired by Canada's War Museum in Ottawa and other artifacts were purchased through fundraising efforts of Lynn Philip Hodgson and other supporters. The Lynn Philip Hodgson Camp-X Collection opened on November 8th, 2012 at its new permanent location at the Region of Durham Headquarters located at 605 Rossland Road East in Whitby. The collection is open to the public free of charge Monday through Friday. Camp X Museum Artifacts, Date Unknown, Photographer Unknown. Whitby Archives D2013_010_005.